After I set up my new computer, I nearly started a newsletter devoted to Carl Kolchak, the downtrodden reporter from the novels and telefilms The Night Stalker and The Night Strangler, and the short-lived TV series Kolchak: The Night Stalker. The 'zine never panned out; first of all, I didn't have enough material, and second, two Kolchak fanzines existed already, Mark Schultz's it couldn't happen here and Gaby Santos' Kolchak Chronicles (later Kolchak Journals), both of which have, unfortunately, ceased publication. If I can't have a newsletter, I reasoned, I could at least have a Kolchak page, and for a few years there I posted Kolchakian news and trivia. Then Geocities shut down its free hosting service, and I let "The Kolchak Papers" vanish into cyberspace. Our favorite reporter-turned-paranormal investigator has seemingly disappeared forever before, though, only to pop back up to take pictures of monsters and try to sneak a story of horror past his editor. I decided to dig out "The Kolchak Papers" and toss it into the Web again, only slightly edited. And when new announcements on the Night Stalking front appear, I'll be sure to post anew. 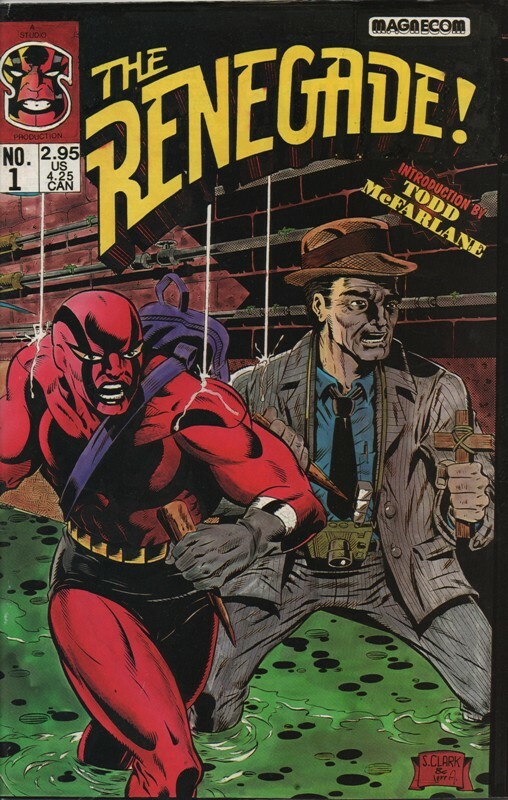 I finally hunted down one of the rarest Kolchakian items, Sterling Clark's 1993 comic book, The Renegade no. 1, touted as the first officially sanctioned appearance of Carl Kolchak since the end of the 1974-75 TV series. I must report that it vastly exceded my every expectation! I was afraid that the main character of this comic -- Kurt Villareal, who fights crime as the masked superhero The Renegade -- would probably be chasing after some monster and bump into a certain rumpled reporter in a graveyard or sewer -- and the two would look at each other in puzzlement for a moment, then go their separate ways. That's how some "crossovers" go. Fortunately, Kolchak gets more "screen time" than that. Of course, the Renegade carries the lion's share of the story -- but he narrates the proceedings exactly like Kolchak, like some disciple carrying on the monster-fighting tradition, which is a delight in itself. It sounds strange, but if you pick up this comic, I would suggest turning to page 30 and reading to the end, then turning back to the beginning. That way you will start with "The Origin of the Renegade," and receive a crash-course on who he is and where he comes from. I don't think it's really a spoiler, as you can probably guess by the picture on the back cover, but Carl and Kurt encounter Jack the Ripper on the streets and in the sewers of New York City. Jack was a character I always wanted to return in The Night Stalker; now if they'll just bring back the Rakshasa and Pere-Mal-Fait . . . The Renegade No. 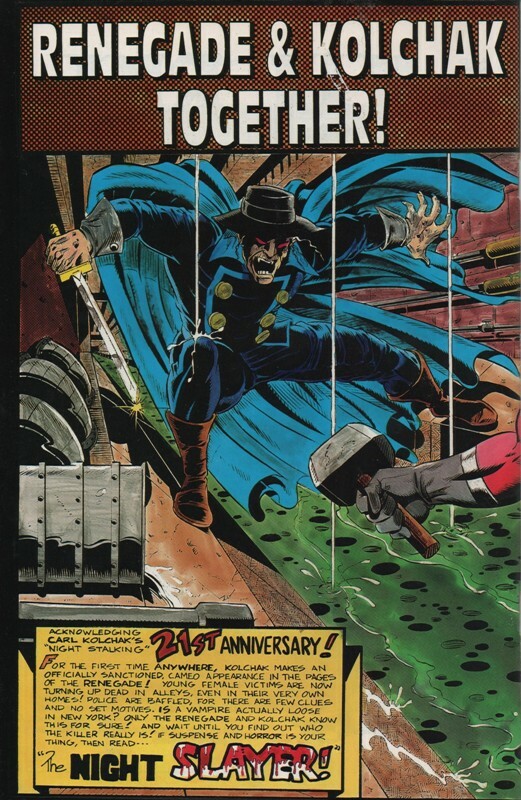 1 (1993), Magnecom Publishing, story and art by Sterling Clark; Story Consultant, Jeff Rice; Introduction by Todd McFarlane; Afterword by Jeff Rice. April 2006? Seriously, that was the last update? Well, can't be helped. All I can do is revive the ol' web-page with new things Kolchakian. I've always wanted to write a Kolchak novel, but who has the time for what would be, essentially, a fannish story? I've also always wanted to write a novel about the notorious Jack the Ripper. And, Night Stalker nerd that I am, I always wanted to know how our seedy monster-fighting journalist met the INS crew for the first time: Dear old Miss Emily, snide little Ron Updyke, and Brooklyn-born wanna-be Monique Marmelstein. So I did. Here is Part One of The Kolchak Papers: The Ripper from a screenplay by Rudolph Borchert, with characters created by Jeff Rice, and with assorted added scenes to build it up to novel length. Because Kolchak's coming back--in style! Well, if you got all your Kolchak-related news from this page, then you were the last person to know that Darren McGavin, the one and only Carl Kolchak, died February 25th, 2006, at the age of 83. His death came within 24 hours of those of Don "Barney Fife" Knotts and Dennis "McCloud" Weaver. As if that were not enough, we lost 78-year-old Dan Curtis that March 27 to a brain tumor. Curtis, of course, was the director/producer of the original Kolchak telefilms, the driving force behind Dark Shadows, and the creator of perhaps the most ambitious mini-series of all time, The Winds of War and War and Remembrance. I finally bought the NIGHT STALKER/NIGHT STRANGLER DVD from MGM. There are two short interviews with Dan Curtis, one for STALKER and one for STRANGLER. It's like a chummy farewell from Dan as he reminisces over Hollywood then and now, the toil, sweat (and fun) of selling and directing made-for-TV movies, and, of course, Kolchak. Rest in Peace, Darren and Dan! Well, if you blinked, you missed the new Night Stalker. It was yanked after six episodes, in the middle of a two-parter that was meant to partially explain Kolchak's past (and the tattoos). I think we all secretly expected it, but it was still mighty annoying. Apparently there are three more unaired episodes; I guess we'll see them on DVD soon enough. It's not as bad as what happened to a similar ABC show, Miracles, which aired a few years back. Although fairly popular, it was yanked with 7 or 8 unaired episodes waiting in the wings. I'll admit that the scripting in Night Stalker left something to be desired. Also, the Townsend Kolchak was an entirely different character from that of Rice/Matheson/McGavin (I like the suggestion that this was a nephew of the original Carl. Townsend is just about the right age . . .) Still, I had hopes it would improve. Supposedly Gabrielle Union signed a six-year contract for Night Stalker. Someone was sure hopeful! On a more positive note, Gaby Santos is back with a new fanzine, The Kolchak Journals. Due to personal problems, #2 appeared nearly a year after #1, but Gaby promises "3 Times a Year" now. Issue 2 covers the comics, the new series, the DVD releases of the telefilms and the TV series -- the whole shebang. Gaby also gives us a look at the real-life inspirations for the characters from Jeff Rice's novel. We're even treated to an amusing photo-joke, "Kolchak's Scary Christmas," which shows the Abominable Snow Monster from Rudolph looming behind a G.I. Joe-sized Darren McGavin doll! The 'zine is slicker, the paper is of a higher quality, the drawings and photographs are clearer, making TKJ an all around better publication than the old Kolchak Chronicles. The only quibble is that some of Gaby's punctuation and language use is odd. Not typos, but the sort of grammatical artifacts that appear when someone is writing in what is not his primary language. Actually, that gives it a sort of personalized style . . . The new Night Stalker finally debuted on September 29. I knew ahead of time there would be major changes in every aspect of the character and story. I'm surprised they kept the details they did. 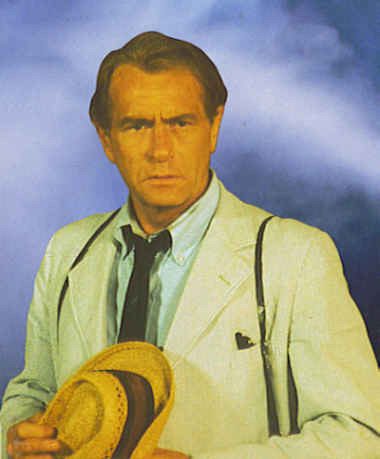 Stewart Townsend's Kolchak is a younger and more serious incarnation of the monster-chasing reporter. He is given the backstory that he was married, and that something in the deserts outside Las Vegas smashed its way into the Kolchaks' car, dragged out Carl's wife, and killed her. Since that time he has investigated strange, violent deaths, connected by a mysterious snake-like mark or tattoo found on most of the victims. Although not convicted of his wife's death, an FBI agent named Fain is certain Kolchak is guilty, and he lurks in the background, always looking for an excuse to arrest him. Tony Vincenzo claims that Carl was the best crime reporter in the business. He puts up with his obsession with the unexplained because he can still come through with great crime stories (once the weird bits have be excised). Then, of course, there are the new characters: Perri Reed, played by Gabrielle Union, and a Jimmy-Olsen-like photographer played by Eric Jungmann, who join Kolchak in his encounters with the weird. LIKES: In the pilot, the POV character was mostly Perri Reed. I like the way Kolchak entered her world (and the viewers') by beating her to the scene of a strange murder. She is surprised to learn that he works for the same newspaper that she does -- and is a crime reporter like she is. The "modern viewer" learns about Kolchak as she does, she investigating him as she would a criminal. Carl was a reporter in Las Vegas, he drives a Mustang like the old Kolchak (but a hardtop to keep out the monsters -- and one painted gold to outshine the "Yellow Submarine"). His boss is still Tony Vincenzo -- a thinner, less blatantly Italian, and much calmer Tony. We glimpse "the hat" once in Kolchak's fab, glass-fronted house (a far cry from the old Carl's seedy apartments). We even get a glimpse of Darren McGavin in Kolchak gear, excised from the old movies and computer-implanted into the newspaper office! FBI man Fain is a very obscure nod to the original novel by Jeff Rice -- Fain was combined with another character for the original TV movie and re-named "Bernie Jenks;" he doesn't exist outside the novel (and Moonstone's comic adaptations). Kolchak now investigates with Perri and photographer in tow; different than the lone wolf reporter of the old days, but you need help with these horrors from beyond, sometimes. Perri is skeptical of Kolchak's theories, but, unlike Agent Scully, who would conveniently get knocked unconscious when an alien mothership flew overhead, Perri does encounter the monsters. My impression from the pilot was that people marked by the snaky tattoo are targeted for attack by someone or something. (It may be that they are now attracting "the thing they fear most," since we are told that a woman who was afraid of burning to death spontaneously combusted.) Eventually a creature or force of some sort tracks them down and kills them -- but afterwards the thing still shambles around, a loose cannon killing people at random. This would explain why the first victims have the tattoo, but later victims do not (as Kolchak points out in his photos). This would also explain why different monsters show up, since people fear different things. It's as good an explanation as any to get the monsters to appear. Obviously, finding out who or what is behind the tats will be the main theme of the series. DISLIKES: Yet, in the next two episodes (which have aired as of this writing), the tattoo aspect has been forgotten. Executive Producer Frank Spotnitz swore Night Stalker would be totally different from The X-Files, but the new episodes have been extremely X-Files-ish; the one with the cult leader in prison was a combination of "Beyond the Sea," "Pusher", and that episode where various appliances tell ordinary people to kill. (It also had some lame dialog). The third episode, with the "Circle of Three," was a little better, but -- again -- people are killed by The Thing They Fear Most, which is quickly becoming cliche. ABC has been pushing the "X-Files" angle, however, so perhaps they demanded some "X-Files"-ish episodes. They also seem to be pushing the gory aspects of the show. Kolchak: the Night Stalker was surprisingly violent for the early '70s, but it consisted of almost cartoonish violence, with monsters tossing around cops, soldiers, and passersby like dolls. The new incarnation is into showcasing bloody corpses and torn flesh, preserved in Kolchak's photos. Still, if people watch all the CSI incarnations, they don't have much to complain about. Bottom Line: We need to see more of Spotnitz's "Tattoo" arc to see how it all works. I just hope Night Stalker remains around long enough to develop it. At least it follows the extremely popular Alias, giving it an edge on the Thursday night competition. Or so I'm tempted to say! Moonstone continues to churn out comic book adventures of the monster-chasing reporter -- including a planned cross-over with Sherlock Holmes (?) by Joe Gentile. I've already mentioned the graphic novel collection, and now, coming October 2005, is an honest-to-Ben Hecht anthology of short stories! Entitled Kolchak: The Night Stalker Chronicles, this volume (also from Moonstone) features mystery writers Stuart M. Kaminsky and Max Allan Collins, comic book writer Chuck Dixon, Peter David (author of Dr. Who and other media-related novels), and fantasy writer P. N. Elrod, among others. You'd think that was the big news this time around, but no. Starting September 1, 2005, is the new Night Stalker TV series on ABC! Gone is the seersucker suit and pork-pie hat; Stuart Townsend's Carl Kolchak dresses in a more modern (if casual) style. Executive Producer Frank Spotnitz (co-producer of The X-Files)has been coy as to the storyline, but he promises the show will be nothing like X-Files. Since "believer" Kolchak now has his own "Scully", a skeptical female partner played by Gabrielle Union, we'll have to see it to believe it. Some reviewers have already predicted that Night Stalker doesn't stand a chance simply because it airs Thursday nights opposite heavy-hitters on the other networks. Well, those are pretty typical Kolchakian odds -- and my money's on the underdog! Gabrielle Union has stated that she hasn't watched the old series because there is no equivalent of her character. However, the irascible and slightly chauvinistic reporter has been helped -- and hindered -- by numerous female characters over the years. In the made-for-TV movie Night Stalker, Gail Foster, played by Carol Lynley, is the woman Carl intends to marry. She convinces Kolchak to investigate the subject of vampirism, and his course is set for life. Like Carl, she is "invited" to leave Las Vegas and is never seen again. Jo Anne Pflug played Louise Harper in The Night Strangler, a slightly dippy college student/nightclub dancer. She experiences some tense moments as she acts as live bait to lure out the title monster in the dark alleys of Seattle. The Night Stalker series premiered with "The Ripper," which co-starred Beatrice Colen as Jane Plumm, a slightly overweight rival reporter who beats Kolchak to the scoop on the story of the modern Jack the Ripper. She would have made a good continuing character, but she gets killed near the end of the episode. (Ms. Colen later appeared regularly as a corporal/secretary on Wonder Woman.) Carol Ann Susi played a similar character, Monique Marmelstein, in three Kolchak episodes. She was sympathetic to Carl, but not really monster-chasing material. Kathie Browne, Darren McGavin's real-life spouse, played police lieutenant Irene Lamont in "The Sentry", the last episode. Since the actors already had a close relationship, the on-screen characters interacted well. Lt. Lamont would have been another good continuing role -- if the series had continued. The main female character in the Kolchak universe, however, is dear old Emily Cowles, the advice columnist at the INS offices. Old she may be, but she often gets info Carl can't reach (because Vincenzo or cops are looking for him), and she sometimes helps Kolchak pull the wool over Vincenzo's eyes. The episode "Horror in the Heights" demonstrated that Miss Emily is the only person in the world Carl actually trusts. The most intelligent and competent female ally Kolchak has, however, exists only on the printed page and inside the comics: Dr. Kirsten Helms of the University of Las Vegas, an expert on mythology, criminology and the occult who provides Carl with the knowledge he needs to defeat his unnatural foes. The briefly-seen character of "Professor Crabwell," played by Margaret Hamilton in The Night Strangler, is the closest we've come to seeing Helms on film. 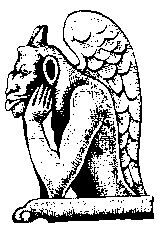 A few more items in the Kolchakian realm: Gaby Santos contacted me a couple of months ago to inform me that his Kolchak publication has returned, The Kolchak Journals Newsletter! And, yes indeed, Moonstone Comics came out with "Kolchak: The Night Stalker" Volume One, a graphic-novel-style collection featuring three issues of their Night Stalker series, plus a never-before-seen fourth tale! It's fairly common knowledge that Chris Carter's X-Files was strongly influenced by Kolchak, and that Darren McGavin (after much coaxing) appeared in that series as an old, retired FBI agent who worked on "X-Files" before there was an X-Files section. In the late 'nineties, however, I had to work whenever Carter's Millennium aired. I was surprised to find out that McGavin portrayed Frank Black's estranged father in the second season Millennium episode "Midnight of the Century." Another boxed set of DVDs I'll have to buy! After watching Kolchak episodes on their 30th anniversaries (on Mondays this year rather than Fridays), I finally succumbed to the urge to write more Kolchakian fan fiction. See "A Stranger in a Bar," in "Tales of the Night Stalker" (below). By accident I've learned of a couple of Kolchak-related releases coming in the near future. On August 24, 2004, the made-for-TV movies The Night Stalker and The Night Strangler will be re-released on DVD by Metro-Goldwyn-Mayer. These discs will contain interview featurettes on the two films. On Amazon.com, I found mention -- little more than mention -- of "Kolchak: the Night Stalker Volume 1" from Moonstone Comics. At 160 pages, this is presumably a collection of Moonstone's graphic novels. The author is listed as Stuart Kaminski. More on this as information leaks in. Carl Kolchak -- a journalistic success? Thanked by the police?? Promoted to editor??? Aren't these the signs of the Apocalypse? Well, it happens in Moonstone Comics' Kolchak: Tales of the Night Stalker #2, "Kyrie", by Dave Ulanski and Chris Marrinan! Which brings in the question: Tales of the Night Stalker? Yes, incredible as it may seem, Moonstone now has two different Kolchak titles, the original Night Stalker and now Tales of . . . The first are long, stand-alone, square-backed works, graphic novels in the true sense of the term. The second is a smaller, saddle-stapled comic with more comic book-type continuity. I've said it before, but -- it blows my mind to see more and more Kolchak in print! Go to Amazon.com and look for "Kolchak". You actually get hits! Maybe it is a sign of the Apocalypse . . .
Also: Digging through the CDs at Barnes and Noble, I couldn't believe what I saw: The Night Stalker and Other Classic Thrillers, released by Varese Sarabande! This album contains Robert Cobert's music from the original movies Night Stalker and Night Strangler, as well as his scores for The Strange Case of Dr. Jekyll & Mr. Hyde, Trilogy of Terror, the inevitable Dark Shadows, and other films. I never cared much for Cobert's scores (don't tell Dan Curtis), but this is a CD every Kolchak fan must own! Quite a bit to report, after a months-long absence from the Kolchak Papers page. I ought to disappear more often -- may make even more Kolchakian things materialize! Actual stories of the supernatural-stalking journalist are few and far between. I have read books over the years that remind me irresistibly of Kolchak, and I think this is the place for them. What Cops Know, Pure Cop, and Breaking and Entering, all true crime books by journalist Connie Fletcher, are collected "war stories" of real police officers on the beat. The anecdotes are given anonymously, but the cops' names are listed in the back of each chapter (at the end of the volume in the case of Breaking). The first two books are based almost exclusively on the reminiscences of Chicago P.D. cops. The street and area names are all familiar to me from The Night Stalker TV series, which was set, of course, in Chicago. Every time one of the officers described a crime scene, I expected him or her to spot a certain nosy reporter in the area! Breaking and Entering is geographically wide-ranging, its stories coming from LA, New York, and points between. It is concerned with female officers, and much space is devoted to the hellacious time females have trying to fit into the "ultimate boys' club," the police department. Fantastic as it was, The Night Stalker books and series were rooted in the seedy reality of big city crime. For a taste of what police work in a major metropolitan area is really like, you can't beat Fletcher's cop trilogy. What Cops Know. New York, Pocket Books, 1990. Pure Cop. New York, St. Martin's Paperbacks, 1991. Breaking and Entering. Pocket Books, 1995. Looks like I've been out of the loop for a while. For twenty-plus years, an absence of several months would have been nothing remarkable, but now there's actual news on the Night Stalker front! First off, Moonstone Comics came out with issues #2 (August 2002) and #3 (March 2003) of their Kolchak comic. Issue #2 features "The Get of Belial," based on a script never used for the Night Stalker TV series. While West Virginia coal miners strike, something is killing both the protesters and the mine owners. Kolchak may be out of his usual environment (the concrete jungle), but he won't let that stand in his way! Issue #3, "Fever Pitch," is scripted by mystery writer Stuart Kaminsky. The storyline is reminiscent of the famous X-Files/COPS crossover in setting and theme, and also of Richard Preston's nonfiction book The Hot Zone. More than that I won't say (see/read them yourself!). Finally we see continuity in the comic. As established in Mark Dawidziac's novel Grave Secrets, Kolchak now works for the Los Angeles Dispatch. Ron Updike is present as well as Vincenzo. Newspaper clippings mention "--PIRE --EGAS" (presumably Vampire in Las Vegas) and a "RIPPER". A yellow sticky note mentions Gordy the Ghoul, and the rather hefty woman seen near the end may be Janie Watson -- a character out of the novels. Also recently announced: A publishing house called Gauntlet Press intends to collect The Kolchak Scripts of Richard Matheson in book form. The volume will contain the screenplays of the two telefilms, plus that of "The Night Killers," co-written by William F. Nolan. The limited-edition book, edited by Mark Dawidziak, will also have interviews with Matheson, Nolan, Jeff Rice, and Dan Curtis. The planned publishing date is sometime in Fall 2003. I've just noticed that, at the "Wold-Newton Family" site of Win Scott Eckert, a short notice about Carl Kolchak is followed by "to learn more about this character, click here." I clicked on that and found -- this page! So I had better give a little more detail about The Night Stalker. The Night Stalker, premiering January 11, 1972 as an ABC Tuesday Movie of the Week. Screenplay by Richard Matheson from the novel The Kolchak Papers by Jeff Rice. Produced by Dan Curtis, Directed by John Llewellyn Moxey. Carl Kolchak, a cynical, streetwise reporter, takes on "a two-day-old, third-rate murder" story and slowly comes to realize that a genuine vampire is stalking modern-day Las Vegas. Starring Darren McGavin, Simon Oakland, Carol Lynley, and Barry Atwater as the vampire Janos Skorzeny. The Night Strangler, premiering January 16, 1973 on ABC. Screenplay by Matheson, Produced and Directed by Dan Curtis. Chased out of Las Vegas by the police and politicians, Kolchak ends up in Seattle, Washington, where he investigates a series of strangulations -- that began 84 years earlier! Starring McGavin, Oakland, Jo Anne Pflug, and Richard Anderson as the alchemist Dr. Richard Malcolm. Kolchak: The Night Stalker, TV series premiering Friday, September 13, 1974. Various directors, writers, et. al. Twenty episodes. Now working for the Independent News Service in Chicago, Kolchak investigates supernatural and science-fictional manifestations, much to the annoyance of his editor, Tony Vincenzo. Which Came First, the Novel or the Telefilm? "I finished The Night Stalker at midnight on October 31st, 1970," says Jeff Rice in a 1974 interview. "I wrote it partially because I'd always wanted to write a vampire story, but more because I wanted to write something that involved Las Vegas." Unfortunately, no one was interested in the book -- as a book. An agent named Rick Ray read it over Thanksgiving weekend and thought it would sell as a movie faster than as a novel. Various persons at ABC read it, including Richard Matheson, who really wanted to (and did) write the screenplay. After many revisions on the script, filming began in August of 1971. The Night Stalker premiered in January 1972. Just over a year later The Night Strangler appeared on ABC TV, story and script by Matheson. Ironically, where Matheson adapted Rice's novel for television, now Rice novelized Matheson's screenplay. "The publication of the books was delayed until the very end of '73 so they could be placed on the top of the publisher's list in the 1 and 2 positions for 1974," reports Rice. Stalker came out in December '73, and Strangler in February '74. . . .Just in time for me to ride down to the local convenience store on my bike after school and buy them, and wonder if any more adventures of Carl Kolchak would ever appear in the wire racks. 1. Satian, Al, and Heather Johnson, "The Night Stalker Papers," in Monsters of the Movies Vol. 1, No. 1, (June 1974), p. 16. I walked into the Comic Empire in Tulsa, and the owner said, "I know what you're here for." Yes, indeed, Moonstone's Kolchak: the Night Stalker had arrived! As mentioned below, the first issue is an adaptation of the original Night Stalker, and it follows the novel as much as the TV movie -- complete with profanity, hookers, transvestites, and other details that show us that Kolchak is used to the seamy side of life. A thick, square-backed comic though it is, it cannot follow the complexities of a whole novel. We see little of Kolchak's snappy patter in the beginning, and his interaction with police and other authorities is limited at first to panels without dialogue. This is a minor point, however, and eventually we reach the Carl of the acid tongue and cutting wit. At last we see that Kolchak is a real human being. He is not universally loathed or laughed at; he has friends, semi-friendly acquaintances, and sources, like any reporter or person. Vincenzo does not automatically quash everything he does or writes; they argue, snap, and yell, of course, but at one point the Sicilian editor says "You got it. A full page, no less. And we're going to make it an extra." I was especially happy to see Carl's old instructor, Dr. Kirsten Helms, finally make an appearance. The Seattle professor played by Margaret Hamilton in The Night Strangler was "sort of" Dr. Helms, but at last she appears (if for only one page) in all her irascible glory. We can only hope that future Moonstone adventures of Kolchak can be half as good as this premiere issue. We've heard it before over the years, and it's never panned out. This time, however, it looks like the real thing: a comic book version of The Night Stalker is on the way from Moonstone Comics. Moonstone promises that their stories will be self-contained, no continuing sagas as is the rule with other companies. They will begin with an adaptation of the original novel The Night Stalker by Jeff Rice, and continue with original tales and adaptations of TV episodes from the old series. Other Moonstone titles of interest include The Phantom, The Avenger, and stories from the "World of Darkness" role-playing universe. Check out the Moonstone site for more info. Kolchak pitted our intrepid reporter against ancient horrors that emerged from the dusty pages of history and folklore into the concrete canyons of modern cities. In this section we will delve into some of the legends behind Carl's stories. "Here Comes a Chopper to Chop Off Your Head"
"A Stranger in a Bar"
On re-reading Night Strangler, then reading a book about . . . the other character in this story, it seem almost impossible that they would not have run into each other in Seattle in the early 'seventies. More than that I won't say. The original book The Night Stalker was the most realistic, gritty novel I'd read up to that time (age 14 or so). Violence, profanity, statistics on the crime and history of Las Vegas, and frank discussions of the Mob, gambling, and prostitution really made it sound like non-fiction rather than a horror novel. Unfortunately, luck has never been with Carl Kolchak, so, after the sequel Night Strangler, our intrepid reporter was not seen again between the covers of a book for twenty years. When Jeff Rice, Mark Dawidziak, and others discussed reviving Kolchak in the '90s, they decided they didn't want an old, tired Kolchak. "We decided basically to pretend that those twenty years never happened," Dawidziak admitted in an interview. "If we just do that, everyone would just have to make the one jump and after they've made the one jump it's done . . . Carl gets fired from his last caper in Chicago, he has to move on. That happened in 1974 and it also happened in 1990." This struck me as a major speed-bump in the "reality" of Kolchak after the documentary-like verisimilitude of the novel. In "Auld Lang Syne," I came up with an alternate explanation -- and now, maybe, we can have Kolchakian tales for years to come . . .
 Schultz, Mark A. "Jumping into the Sewer with Kolchak: An Interview with Mark Dawidziak." it couldn't happen here No. 3, (Spring 1997), p. 5. Castle of Frankenstein magazine Vol. 5, No. 3 (whole no. 19), 1972, page 47: "Dan 'Dark Shadows' Curtis is filming a sequel to NIGHT STALKER for ABC TV's Movie of the Week called TIME KILLER with Darren McGavin. Strange rumors indicate Curtis's next one will deal with a vegetarian vampire entitled THE CELERY STALKER." A note added by editor Calvin T. Beck reads, "we hope it's only a rumor." Fortunately, it was. But wasn't there a "Bunnicula" book like that? Something almost as silly -- yet true -- appeared in Marvel Comics' offshoot magazine Monsters of the Movies (Vol. 1, No. 3, February 1975). On page 48 we find a photograph of something called "The Night Turkey," along with the caption: "Rick Baker (see complete interview in MOM #4!) provides some comic-relief at Fantasy Filmcon II with this conglomerate beastie: the feet of the Octa-Man appended to the body of the Abominable Snowman from George Pal's 7 Faces of Dr. Lao, Rick's own original monster claws, topped off with Rick's fowl creation [a rubber turkey mask] add up to Bill Malone's upcoming video spoof of The Night Stalker: The Night Turkey! Jeff Rice, beware!" As well he should. For good or ill, "The Night Turkey" can now be seen on YouTube! Sometimes we forget to count our blessings. The Powers that Be at least saw it fit to give us two Kolchak films and twenty TV episodes back in the seventies. Many occult investigators had to make due with far less, as we read in "The Measure of Success". The Kolchak Papers: The Ripper, Part One. · The Kolchak Papers: The Ripper, Part Two. · The Kolchak Papers: The Ripper, Part Three. 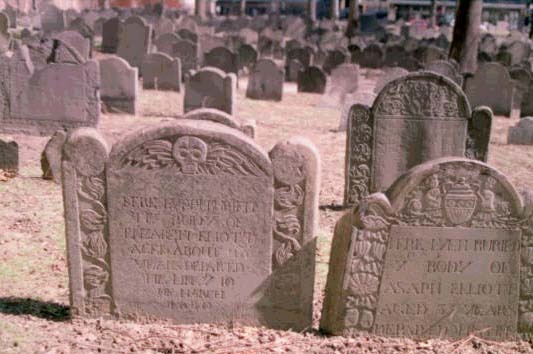 · The Kolchak Papers: The Ripper, Part Four. Carl Kolchak, Tony Vincenzo, and related characters are copyright © Jeff Rice. The articles and fiction on these web page are not for profit and are not meant to infringe on the copyrights of Jeff Rice, Darren McGavin, Mark Dawidziak, ABC Productions, Dan Curtis Productions, Francy Productions, Pomegranate Press, or Universal Studios.